The majestic red gums have always appealed to Australians. This river red gum (Eucalyptus camaldulensis) near Wilpena Pound, South Australia, was made famous by the photographer Harold Cazneaux who took a picture of it, with the walls of Wilpena Pound as background, in May 1937. He regarded it as his most Australian picture and called it the Spirit of Endurance. It won many awards in Australian and International exhibitions. This image belongs to the travel and nature stock photo library. 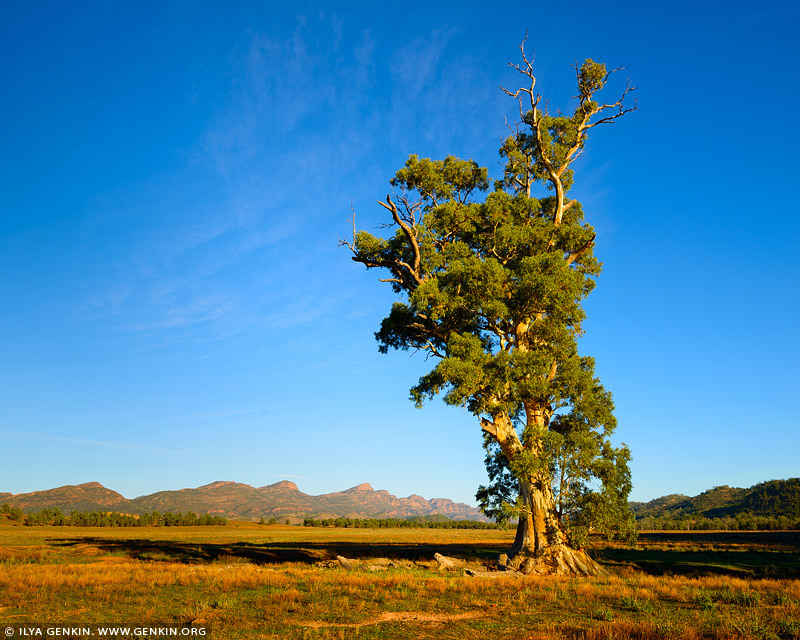 This stock photo of Cazneaux Tree, Sunrise is available for licensing for commercial and editorial uses including websites, blogs, books, magazines, brochures and advertising. Restrictions may apply for images which contain third party copyrighted material or sensitive subjects. Photos of artwork are for editorial use only. This image id AU-SA-FLINDERS-0013 of Cazneaux Tree, Sunrise, is copyrighted © by Ilya Genkin. This is not a public domain image.